Say hello to second guest post on my blog written by amazing Maša. Thank you dear for writing this great post for my blog. I will definitely use similar products for New Years Eve. Go visit Low Maintenance Blog or like Maša's blog on FB or follow her on IG. I am very happy to be doing my first guest post ever on Ana’s beautiful blog. I decided to write a short post about my favorite make-up products for the Christmas season. I think that these 5 products are absolutely stunning and perform beautifully. Besides that, they would suit every skin tone imaginable so if you want to try them out, go for it! I definitely associate the holiday season with bolder colors and a lot of shimmer which is why I chose the following products: The Balm Mary-Lou Manizer highlighter, L’Oreal Color Infaillible (Sahara Treasure) eyeshadow, Essence lipstick in shade Pink & Perfect from the Merry Berry collection and the Avon Magic Effects Mineral Crush nail polish in shade Ruby. This bright red nail polish is all sparkle so if you’re into that kind of thing, I think it screams Christmas from miles away! And since we all know that we want our make-up to stay perfect throughout any Christmas party, I am finishing my top five products with the Urban Decay De-slick Make-up setting spray. It’s a great setting spray that I’ve used for quite a bit now and it really gives my make-up a lot of staying power, so I highly recommend it. 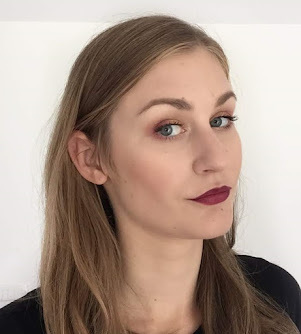 I am a big fan of dark lip in winter and I’ve been trying to wear bolder colors for some time now. This Essence lipstick is a nice fuchsia shade with a lot of pigmentation and a good staying power. It’s my favorite shade from the Merry Berry collection which is still available in stores. The Balm Mary-Lou Manizer has been favorite highlighter for quite some time now. It’s not too shimmery to wear every day and at the same time can really be used to intensify the look by strobing, which is highly popular at the moment. I usually apply some on my cheekbones, bridge of my nose and above my cupid’s bow and voila – I’m good to go! I also can’t say enough good things about the L’Oreal Infaillible eyeshadow. It’s quite different to your regular eyeshadow since it’s creamy and really needs to be applied with fingers. Although I don’t exactly enjoy the mess this process requires, I still absolutely love this golden shimmery shade on my eyelids or gently blended into the crease. That’s it for my top five products. I hope you enjoyed this post and I wish you all happy holidays!